Art in the Park, showcasing handmade, original art by Naples Art Association member artists, takes place on the first Saturdays of the month between November and April each year. If you haven’t explored downtown Naples for Art in the Park this season, there’s still one more chance! Artists will be showing and selling their work on Saturday, April 6, 2013 from 10 a.m. to 4 p.m., with free admission and activities all along Park Street and inside the von Liebig Art Center — just one block south of Fifth Ave. S.
April’s Art in the Park wraps up the show’s 56th season. It has been an exciting year, featuring more than 70 artists. Executive Director Aimee Schlehr says this show is a special benefit for the Naples Art Association’s members. “Art in the Park gives those member artists an opportunity to showcase their one-of-a-kind artwork, and the community gets the chance to engage with artists that live in their community,” Schlehr said. First Saturdays also features make-and-take art projects for children of all ages for free. Instructor Kim Walbert leads the fun! Families travelling to Art in the Park this year have had extra fun. Art instructor Kim Walbert has provided make-and-take art projects for children of all ages. This year, she’s shared creative ideas including monoprints, ornament design and more. 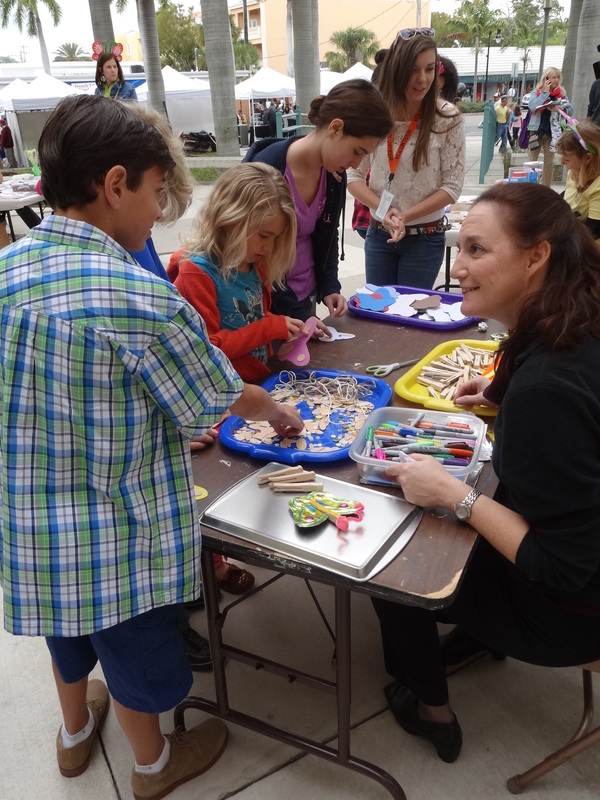 On Saturday, join in the make-and-take action on the front deck of the von Liebig Art Center from 11 a.m. to 2 p.m.
Click here and put Art in the Park on your calendar for April 6, 2013. Located along Park Street, at the von Liebig Art Center and in Cambier Park. This month’s Art in the Park presented by Naples Art Association will coordinate with a neighboring event by Avow Hospice, which is celebrating its 30th Anniversary and annual butterfly release event in Cambier Park. Festivities begin at 10 a.m. and include a live butterfly exhibit showcasing hundreds of butterflies, children’s activities, and new this year, a concert featuring Johnny T., “the man of many voices” who performs nostalgic songs from classic artists like Dean Martin, and Frank Sinatra. At noon, a community memorial service will be held and will include inspirational readings, music and the public reading of names of loved ones being honored. At the conclusion of the service, the exhibit tent will be opened to allow the butterflies to take flight. In coordination, Naples Art Association’s Art in the Park showcases handmade, original art by its member artists. Art instructors will lead make-and-take, butterfly-themed art projects for children at the butterfly release from 10 a.m. to noon and on the front deck of the von Liebig Art Center from 11 a.m. to 2 p.m. Artist David Arrowsmith will give live art demonstrations throughout the day. Plus, WGCU’s Curious Kids will also be on site filming for an upcoming episode! Special thanks to the generous sponsors of Art in the Park: WGCU Public Media, Happening A&E Magazine, Russell’s Clambakes, Florida Weekly, and Costco Naples. The Naples Art Association is a 501(c)(3) nonprofit organization, founded in 1954 by local artists. Its mission is to educate and promote visual arts in Southwest Florida. Through its programs, the Naples Art Association is dedicated to serving individual artists of all ages and skill levels, along their creative journeys. The NAA operates The von Liebig Art Center, located at 585 Park Street in downtown Naples. It’s open Monday through Friday, 10 a.m. to 4 p.m., Saturdays in season. For more information, please call 239-262-6517, visit http://naplesart.org/. Rounding out 2012 with a great variety of fine art (both in gallery exhibition and an outdoor art festival), the Naples Art Association celebrated member artists and engaged creative enthusiasts within the community. December 2012 events included the opening of two new exhibitions, Art in the Park, educational classes and workshops such as Wine and Dezine as well as community-coordinated activities including the Fifth Avenue South Tree Lighting on Dec. 6, 2012. For the tree lighting, Home Depot generously donated six fraiser fir trees to the Naples Art Association. These trees were decorated by attendees, and the fully decorated trees were delivered to families in need in Collier County. Event attendees to Art in the Park on Dec. 1, 2012 not only had the chance to see great art and build make-and-take art projects, but they were also invited to help glaze ceramic bowls, made by instructor and artist David Hammel. The finished bowls will be donated to the Harry Chapin Food Bank for their 2013 Empty Bowls fundraiser, which helps to feed the hungry in Collier County. Naples Art Association also awarded more than $2,500 in cash prizes to exhibiting artists in the National Art Encounter 2012-13 and the Members’ Gallery All-Media show. Relive the fun in the gallery below! The NAA staff works together to deck the halls at The von Liebig Art Center. Our tree includes art supplies such as miniature figure models and paintbrushes…. and a color wheel! Creative decorations courtesy of Jackie Ressa. Each tree had a different theme. Home Depot donated six fraiser fir trees to us. Families helped us create handmade ornaments to decorate each one at the Fifth Avenue South Tree Lighting event. After the glitter of the evening settled, the trees were donated and delivered to area families in need. Bob Saltarelli of PNC Wealth Management and the United Arts Council Board visits the NAA Staff meeting to announce that Curator Jack O’Brien has been selected as a 2013 Star of the Arts. Instructor Anne Chaddock models the new Wine and Dezine paint smocks. At the National Art Encounter 2012-13 and Members’ Gallery All-Media Exhibition Preview Reception. Photo by Avant Garde Images. At the New Members Champagne Reception. Photo by Avant Garde Images.